Within India, GICs are exploring Tier II/III locations like Ahmedabad, Coimbatore, Vadodara, due to proximity to manufacturing, access to niche or low cost talent, etc. 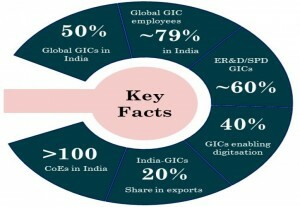 GICs – The differentiating value: Set up initially with a pure focus on cost reduction and on outsourcing standard, repetitive support functions, GICs in India have today matured into key strategic partners for their parent firms. Cost is no longer the primary driver; boardroom discussions now focus on how the parent can leverage its GIC for transforming business globally. Over 30 per cent of GICs are multi-function centres and are bringing in new capabilities to their global portfolio, going beyond cost and scale. Parent firms are also using the GIC as a platform for local market access and to manage local partnerships. GICs have also taken on the role of enabling digitisation for the entire enterprise through smart automation, building technology platforms and advanced tools for operational excellence. Robotics Process Automation (RPA) is one such technology that is being rapidly adopted among GICs, esp. in the F&A space. This adoption of technologies and the changing role of the GIC is leading to a shift in various business models – ‘cost plus’ to ‘transaction based’, hybrid pricing models and further growth of multi-function centres.